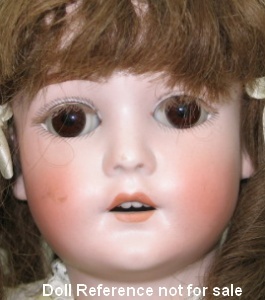 Marseille Dolly Face doll mold 370, antique bisque shoulder head doll, 20" tall on kid riveted jointed body, sleep eyes, painted brows, painted upper and lower eye lashes, open mouth teeth. Armand Marseille of Sonneberg and Koppelsdorf, Thüringia, Germany was one of the worlds largest and best known bisque doll head manufacturers. The founder was born in 1856 in St. Petersburg, Russia the son of an architect and immigrated to Germany with his family after 1860. 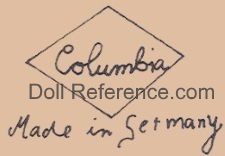 In 1884 he bought the toy factory of Mathias Lambert in Sonneberg and in 1885 acquired the porcelain factory of Liebermann & Wegescher in Koppelsdorf . . . and his empire in the doll world began. From 1900 to 1930 it's reported Marseille produced 1,000 bisque doll heads a day, they made bisque head baby, children, lady and character dolls, on cloth, kid or composition bodies, most with glass eyes, some with painted eyes, with the most commonly found doll molds of 370 (shoulder head on a cloth or kid body) and 390 (socket head on a composition body). Marseille interestingly did not produce the body of their dolls, but purchased those from other doll manufactures. In 1919 Ernst Heubach and Marseilles merged and formed the United Porcelain Factory of Koppelsdorf (Vereinigte Koppelsdorf Porzellanfabrik vorm Armand Marseille and Ernst Heubach). By 1932 the two companies went their separate ways. ca. 1894+ Marseille Dolly Face doll, 10-42" tall, bisque shoulder head on a kid leather rivet jointed or cloth body, partial composition or bisque lower arms, some with composition or bisque lower legs too, wigged, glass eyes, some have fur eyebrows, open slight smiling mouth, dimple on chin. 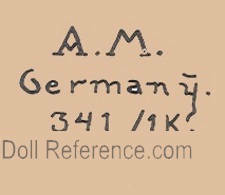 Doll mark Made in Germany AM, Armand Marseille in the marking with the mold number. 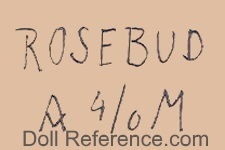 Doll names were: Alma doll, Bessie doll, Columbia doll (made for CM Bergmann, Darling doll, Duchess doll, Florodora doll, Lilly doll, Lissy doll, Mabel doll, Miss Millionaire doll, My Companion doll, My Dearie doll, My Lovely Doll, My Pet doll, My Playmate doll, My Sweetheart doll, Our Anne doll, Rosebud doll, Roseland doll, Daisy Dimple doll or Sunshine doll, Dainty Dorothy doll (all distributed by Sears, Roebuck & Co - has a paper label on chest with doll name). The red fluted labeled dolls; Registered American Beauty Germany doll, Real Kid doll, 1/2 Cork Stuffed, Cork Stuffed, Kid Body plus doll mold 246 may also be by Marseille. However, other doll makers used this mold number too. Other similar doll molds are: 270, 309, 370, 376, 920, 2015, 3200. Florodora, A 2/0 X M, Made in Germany, DRP. bisque shoulder head on a kid body. ca. 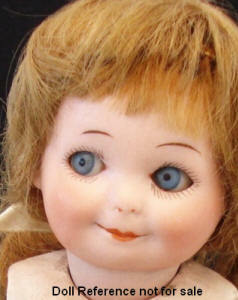 1894+ Marseille Dolly Face doll, 5-42" tall, bisque shoulder head on a kid or composition body, wigged, glass eyes, open slight smiling mouth, dimple on chin. 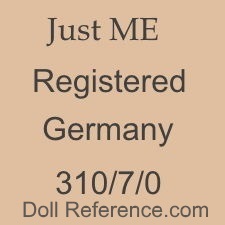 Usual doll mark AM DEP Made in Germany in the marking with the mold number. 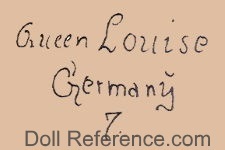 Some of the dolls names are: Baby Betty doll, Baby Florence doll, Beauty doll, Jubilee Dolls for Strobel & Wilken, Majestic doll, Princess doll, Queen Louise doll. Tiny Tot dolls 5-7 1/2" tall, bisque head, composition jointed body, white painted legs, molded painted high heel single strap tan shoes, doll head marked; Germany A 12/0 M, round blue tag with white letters: Tiny Tot Reg. U.S. Pat. Off. Germany. Tiny Tot doll, all bisque with molded painted hair, 2 1/2", closed mouth, same round blue and white label on tummy, Tiny Tot Reg. U.S. Pat. Off. Germany, incised mark on back Germany. Doll shown on right is a Queen Louise shoulder head doll, 23" tall. Marseille Queen Louise doll, 24"
Marseille Dolly Face doll, bisque socket head doll, various sizes from 10 - 42" tall, composition jointed body, wigged, glass eyes, open slight smiling mouth. Usually has Made in Germany Armand Marseille in the marking with mold number. Doll shown on left; ca. 1900 Marseille Princess doll, mold 29 with jointed composition body. 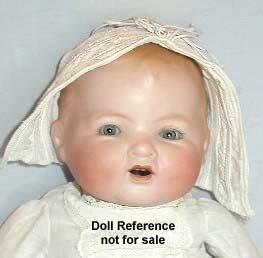 Other similar dolls were named: Baby Betty, Florodora, Queen Louise, Rosebud. with stick like legs on a jointed composition body. 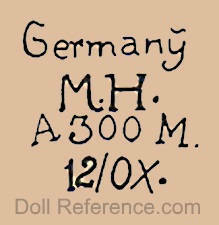 Marseille Character Baby doll, usually has Germany A.M. DRGM or DRMR in the marking with the mold number. 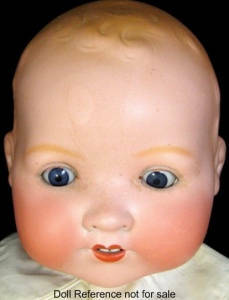 Bisque head, glass eyes, painted upper and lower eyelashes, feathered eyebrows, open or closed mouth, wigged, composition jointed body or kid. A named doll is Fany doll mold 231 wigged, shown at right or Fany doll mold 230 who has molded, lightly painted hair no wig. Little Sister is doll mold 326. 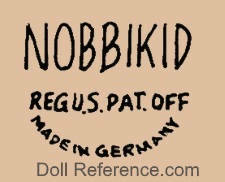 Minnit Baby doll mold 971 who was made for George Borgfeldt and Baby Betty doll or Fany doll + DRGM in marking. 23" tall, shown without her wig. 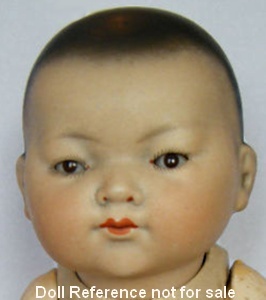 Marseille Infant Baby dolls, bisque head with a composition bent limb body or flange neck with cloth body, usually marked with AM Germany + a mold number, the bisque doll heads with a composition jointed body have a K at the end of the marking. Mold numbers and names: My Dream Baby doll molds 341, 341K, 341ka, crying My Dream Baby doll 342, 351, 351k, all bisque My Dream Baby doll 620 and Our Pet doll, Kiddiejoy doll or Kiddie Joy. Marseille Our Pet doll, 8 1/2"
Marseille My Dream Baby doll, 8-22" tall, bisque head, lightly painted hair, painted or sleep eyes, doll mold 341 has a closed mouth, cloth body with bisque or composition hands or composition jointed body, came as either a white doll or black doll. 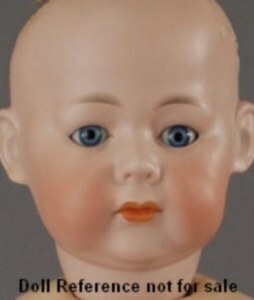 Doll face shown is a flange bisque head with painted eyes on a cloth body. 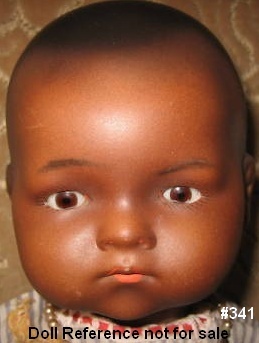 Marseille My Dream Baby doll, 8-22" tall, bisque head, lightly painted hair, painted or sleep eyes, doll mold 351 has an open mouth with two upper teeth, cloth body with bisque or composition hands or composition jointed body, came as either a white doll or black doll. 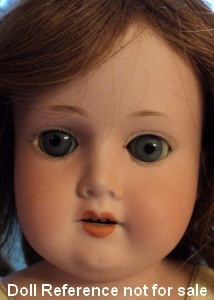 Doll face shown is a socket bisque head with sleep eyes on a composition jointed body. Marseille Named Character Baby dolls, bisque head flange neck or socket head, cloth body with composition or bisque hands or all composition jointed body, most with bent baby type legs. 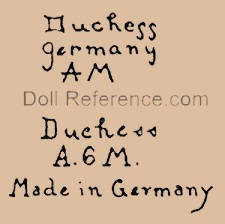 Other named dolls are: Melitta doll for Edmund Edelmann, doll mark Ellar and doll mold 253, 353, 353k, are Oriental baby dolls, Baby Phyllis doll, Baby Gloria doll and Kiddiejoy doll, Kiddie Joy doll for Hitz, Jacobs & Kassler. 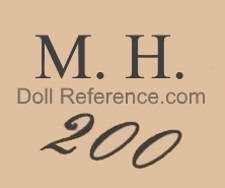 Marseille Ellar marking, Oriental Baby doll, 11"
Marseille Baby Gloria doll, 16" tall, bisque flange head (also came with a rubber head), cloth body, bisque or composition hands, molded painted hair, open mouth, clothing shown may not be original, Baby Gloria's name is part of the marking. 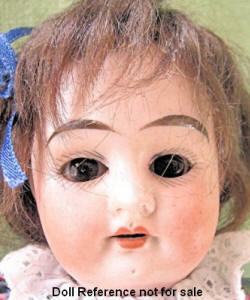 Baby Gloria was distributed by Roth, Baitz & Lipsitz, then after 1929 by the Maxine Doll Company. Marseille Baby Phyllis doll mold 240, bisque shoulder head, cloth body, partial bisque or composition hands, bent baby or straight legs. Baby Phyllis doll shown is 11" tall and has her name in the doll marking. A. Bye-Lo Baby type. 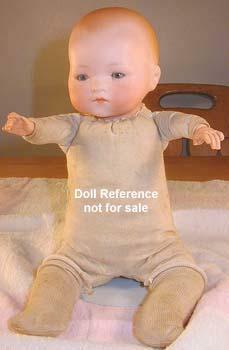 Baby Phyllis was sold by Baby Phyllis Doll Company, then Bouton-Woolf. ca. 1920 Marseille Googly Eye dolls, bisque head with glass side glancing googly eyes, closed smiling mouth, jointed composition or papier mache toddler body, some with painted socks an shoes. 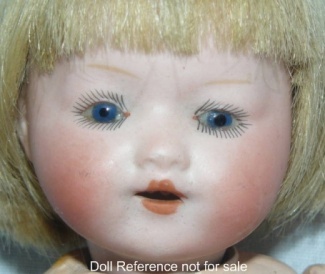 Doll shown on right; Marseille Nobbikid doll mold 253, sold by George Borgfeldt, has blue side glancing googly eyes with painted upper and lower lashes, single stroke eyebrows, closed smiling mouth, jointed composition toddler body. Other Armand Marseille Googly eye doll molds are: 200, 210, 210e, 240, 241, 252, 253, 254, 257, 258, 310, 323, 324, 325. Note: these Googly doll mold numbers are not exclusive to Marseille, other doll manufacturers may have also used them as well. ca. 1925 Marseille Just Me doll, Character doll, sized 7 1/2" - 13" tall, bisque socket head, side glancing sleep eyes, painted lashes, feathered brows, closed bow mouth, jointed composition body, doll mold 310 or 318. 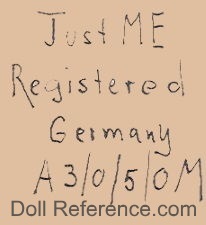 The Just Me dolls were first sold by George Borgfeldt, later by the Vogue Doll Company, too. Marseille doll mark Our Anne Germany with initials P.D.G. 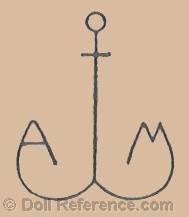 Co.
symbols of an upside down horseshoe, an anchor, another doll makers name, plus many others. 93, 95, 101, 121, 189, 200, 205, 210, 210e, 223, 225, 230, 231, 232, 233, 234, 240, 241, 242, 244, 246, 248, 250, 251, 252, 253, 254, 255, 256, 258, 259, 260, 266, 270, 273, 276, 300, 309, 310, 314, 318, 320, 322, 323, 324, 325, 326, 327, 328, 329, 333, 340, 341, 341K, 341Ka, 342, 345, 347, 350, 351, 351K, 352, 353, 353K, 354, 356, 360a, 362, 363, 369, 370, 371, 372, 375, 376, 377, 378, 382, 384, 390, 390n, 391, 395, 396, 398, 399, 400, 401, 406, 410, 411, 414, 449, 450, 451, 452, 452H, 453, 454, 458, 500, 504, 505, 510, 513, 515, 516, 518, 519, 520, 540, 541, 542, 550, 550a, 551, 551K, 560, 560a, 580, 570, 580, 590, 599, 600, 620, 621, 630, 640a, 640b, 670, 696, 700, 701, 710, 711, 750, 760, 790, 800, 810, 820, 900, 920, 927, 950, 951, 957, 966, 970, 971, 971a, 972, 973, 975, 980, 982, 984, 985, 990, 991, 992, 993, 995, 996, 997, 1321, 1330, 1333, 1353, 1361, 1369, 1370, 1374, 1376, 1500, 1776, 1890, 1892, 1893, 1894, 1895, 1896, 1897, 1898, 1899, 1900, 1901, 1902, 1903, 1905, 1909, 2000, 2010, 2015, 2542, 2966, 3066, 3091, 3093, 3200, 3300, 3500, 3600, 3700, 4008, 5990, 201013, CAMA. Note: doll mold 800 and 201013 have a talking device activated by a lever in the doll head, doll mold 452 is a wigged Shirley Temple type, doll mold 452H is a molded hair Shirley Temple type doll, doll mold 352 is a Baby Love doll, doll mold 560a is a Dorothy doll. ** possibly made for Max Handwerck ?? Roth, Baitz & Lipsitz dist.